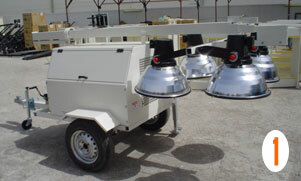 ALL FLOOD LIGHT ARE MADE IN ITALY AND DIESEL ENGINES IN THE U.K AND BASE FRAMES IN THE U.A.E BY SOUFAN INTERNATIONAL SERVICES STEEL WORK SHOP. Akar's Model LT4000 Series Light Tower provides mobile, trailer mounted flood lighting for nighttime maintenance, construction, mining, and emergency work. It consists of a trailer with diesel or petrol powered 5KW generator, and a 30-foot cable actuated tower with four (4) 1000-watt floodlight fixtures. The trailer frame is made from 50mm and 75mm square steel tubing. The trailer frame is open to allow cooling air to rise within the unit to cool the ballast, engine and generator. The tower support is welded to the front of the trailer frame and is made from 100mm square steel tubing Steel. Two outriggers extend from the rear and front of the trailer frame creating a side to side stance. Each outrigger has a 3000 lb (1360kg) leveling jack attached that swivels up for travel. The outriggers are made from 40mm square steel tubing with a 3mm wall thickness. The outriggers are hot dip galvanized after fabrication. The outriggers extend 1000mm from the trailer frame. The front tongue is removable for storage or shipping purposes but will be bolted into the proper position when shipped from the factory unless the units are crated or racked. NOTE: Adjustable height hitches are adjustable from 16" (406mm) to 36" (914mm) in approximately 2" (50.8mm) increments. The axle is rated at 3500 lbs (1588kg) with two springs made up of two leaves and rated at 1750 lbs (795kg) each. The axle hubs are rated for highway speed and are 5 bolts on a 4-1/2" bolt circle. The wheels are 13" automotive type with black wall tubeless tires. The fenders are rolled 2MM Steel. The jacks are rated at 3000 lbs (1362kg) and are swivel type and Top-wind handles. When the trailer is level, both outriggers extended and all three jacks on firm ground, the light tower will withstand wind gusts to 62 mph with the 4 light fixtures (MH, MV, HPS) facing into the wind at an elevation of 8m. The tower is attached to a pivot post that is mounted to the front of the trailer frame. The tower pivots on a 15MM diameter plated steel pin. NOTE: All square tower sections are electrostatic powder coated. Each tower section has a self lubricating plastic guide riveted to the top contact point to enhance the telescoping of the tower sections. The tower sections rest on a self lubricating plastic bushing located in the bottom of the 6" (152.4mm) round tube. Another self lubricated plastic bushing is fitted around the top of the 6" (152.4mm) round tube. These two (2) bushings permit the tower sections, with the fixtures attached and at operating height, to be rotated 360o by hand with ease. A "TEE" bolt is provided to lock the tower at any chosen rotated angle. This is a sample and reliable manual rotation which can be done while standing on the ground. A mechanical stop is used to prevent the tower from pivoting in the horizontal position if the tower is not rotated to the proper travel position. A single hand operated safety winch is provided to pivot and telescope the tower. The winch is mounted inside the generator enclosure (cabinet) to protect it from dirt, environmental conditions, and physical abuse. The winch is rated at 2500 lbs single line pull with a gear ratio of 5:1:1. A safety brake clutch mechanism retains the load during raising and lowering of the tower so free-wheeling cannot develop. The winch is zinc plated throughout and has a drum diameter of 2-1/2" (63.5mm) to prevent excessive cable bending stress. The cable sheaves are machined from engineering grade cast nylon and are mounted with stainless steel clevis pins. The sheave mount plates are welded to the tower sections before galvanizing. The tower cables are 7x19 galvanized steel construction with a breaking strength of 7000 lbs (3178 kg). The cables are internally lubricated. Strength and durability exceed normal commercial standards, and equal the very demanding U.S. Military Standards. A 12-volt electric winch is available as an option. The generator enclosure is made of 2mm. Steel to support the tower in the travel position. The generator enclosure is of a bolt together design and attached to the trailer frame with four (4) ½" bolts to allow for easy removal of enclosure for major repair work to the engine or generator. The rear and front of the enclosure is louvered to permit air flow inside the enclosure to keep the engine, generator and ballast at an adequate operating temperature. The doors are sloped in design and open upward allowing operators greater access to the equipment than provided by the more conventional vertical design doors. The doors are equipped with gas-charged shock absorbers to provide smooth, dependable operation and to hold the doors firmly in the open position. A hasp and keeper are provided on each door to allow padlocks to be used secure the equipment. A 5 KW air cooled diesel generator set is provided as the standard unit. The engine has a heavy-duty cyclo-pak type air cleaner suitable for dusty environments, and paddle switch operated electric starter. The generator is a single bearing design directly coupled to the engine. The generator is a totally brush less, revolving field generator with class F insulation. It is rated at 240-volt single-phase 50Hz. The generator set is mounted to the trailer frame on rubber vibration mounts with through bolt to restrain the generator set when traveling over rough terrain. The generator set is exceptionally quiet and vibration free when in operation, and is rated 5.0KW at 40oC ambient with 105oC rise at unity power factor. It is capable of operator four (4) metal halide floodlights at an altitude of up to 5000 feet above sea level. The ballasts are rated for 1000 watts and are the constant voltage auto-transformer design with separate ballast for each lamp. Each ballast is mounted in a separate galvanized steel enclosure. The ballast boxes are mounted directly to the trailer frame with an air gap between each box for good convection cooling. The ballasts are connected to the control box with weatherproof circular connectors so that individual ballast can be replaced without disconnecting wiring terminals. The control box is located inside the generator enclosure. The control box contains all the DC engine controls and AC power controls and receptacles. One (1) 240 volt, 20-amp (protected by the main breaker). Toggle switch circuit breakers to protect and control each MH, MV, OR HPS floodlight or each pair of TH floodlights. A 12 volt group 32 battery with a minimum of 440cca @ 0oF and a reserve capacity of 75 minutes @ 80oF is standard. A heavy-duty battery with a minimum of 610cca @ 0oF and a reserve capacity of 120 minutes @ 80oF is also available as an option. Clean with detergent to remove all oils. Phosphatize with iron phosphate in a hot dip tank. Rinse with hot neutralizing chemical rinse. Paint with one coat of heavy-duty long life primer. Paint with two coats of heavy-duty long life Amida Beige Enamel. Bake @ 160oF for 20 minutes. The painting process will withstand a 250-hour salt spray test in accordance with ASTM B117-62. One operation and service manual will be furnished for each unit shipped. Check-list for checkout on receipt of unit. Parts list drawings with part numbers for replacement parts. Disassembly and reassembly procedures for the tower. Troubleshooting guide with symptoms, causes and corrective action. Manuals supplied by vendors including an engine manual and generator manual. A complete engine workshop manual can be ordered as a separate item if desired. A statement of manufacturer's warranty.